A nice restaurant with Good food. 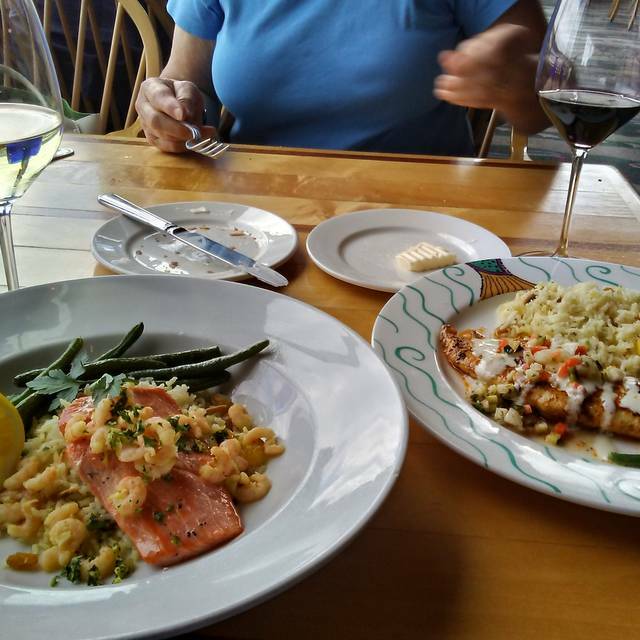 A quiet alternative to Anthony's Gig Harbor. They are both very enjoyable. Hard to beat that view. And, the food is always good. Service was great. We were celebrating my wife's 75th birthday. Our waiter, Tyler, was more than excellent, he was just great. So friendly and Tyler kept his eye on us, even when very busy, to ensure we were having a most enjoyable evening. Our son joined us and the three of us had a very nice meal and enjoyed it so much. Anthony's at Sinclair Inlet is such a nice restaurant with such an excellent selection of dinners. Thank you Anthony's, and thank you to Tyler our server. My wife and I both had the fried yearling oysters. They were Excellent!! We went for the Sunset Dinners. Reservation at 5:45. Disappointed that they were out of the main course I ordered (garlic prawns) and only had 3 Kumamoto oysters left (we ordered a dozen). Our waitress was great. She recommended a pear martini which was so good I had it again when we came in the next week. Loved the whole experience!! Seated/greeted immediately by a bright and friendly staff person. Orders taken quickly! Food was fabulous! Dessert to die for! Waiter was friendly, attentive, relaxed vibe, just a very wonderful dining experience with my best friend!! Will absolutely return! Went for a birthday- very lovely view and the oyster fan was happy. Our table was ready when promised, the service was excellent and the food was very good. Have been to this Anthony's on many occasions and will continue to do so. Great seafood and deserts. Mixed Drinks are excellent. First time at Anthony’s. Our table had a beautiful water view. We enjoyed a fabulous 4-course meal while watching the ferry come and go. Very decent value and well crafted menu. Highly recommend! Great food, great service, great table. However, on the reservation, I put that it was my wife's 65th birthday. A candle in the dessert or an extra dish of ice cream or something would have been appreciated, but there was nothing. When we left, my wife casually mentioned to the hostess that it was her 65th birthday but nobody said anything. So, the hostess said "well, happy birthday". Again, anything would have been appreciated but there was nothing. I had the 4 piece fish & chips & was very good.Not at all greasy. Took my wife for her Birthday dinner with friends had a wonder time. Great Service and great food! Anthony's was very welcoming and attentive, We brought friends from New Mexico who had never really seen the sound like that. 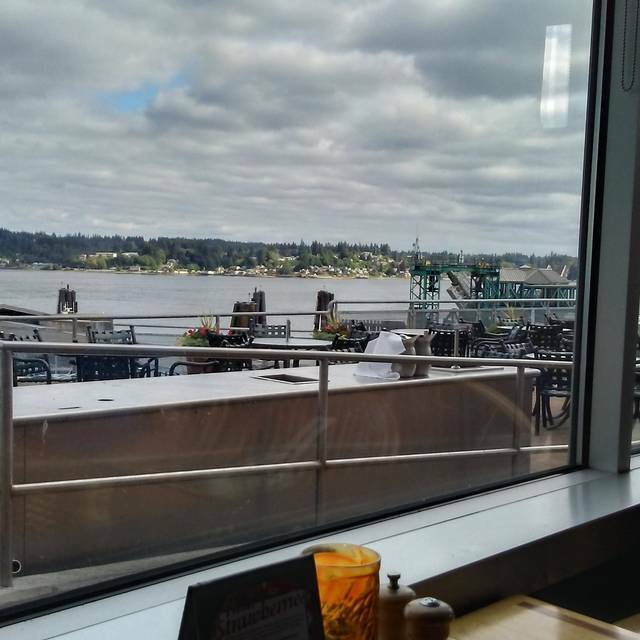 They got to see the Ferry, have delicious food and a nice view. Wonderful servers! 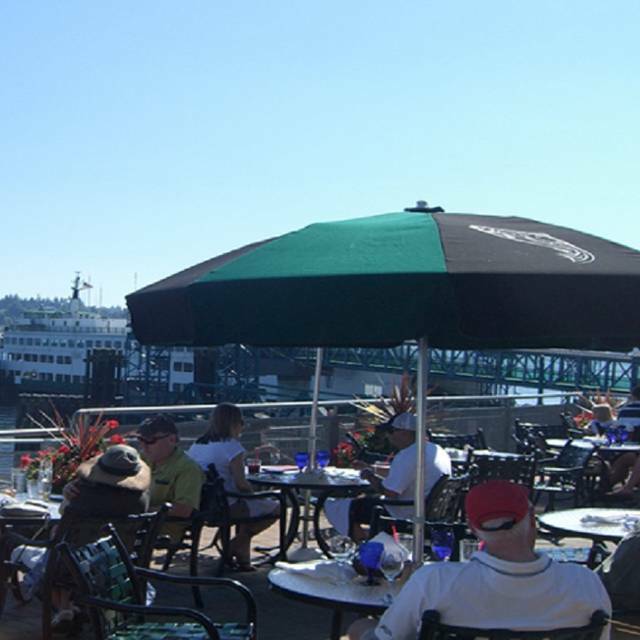 We walked on the ferry in Seattle and crossed the Sound in spectacular sunlight with Mt Rainier in all its glory - and after landing in Bremerton name the short stroll to the marina and Anthony’s. The outdoor seating was perfect. The beautiful sunshine must have been a surprise for the restaurant, because the number of customers seemed to overwhelm the limited number of staff. The resulting service was slow - but friendly and helpful. Our oysters were fabulous - but the bread was dry. The mixed seafood salad and the chowder were both awesome. We’ll do this dinner ferry cruise again soon... I just hope they add some staff... we almost missed our ferry home! We chose to avail ourselves of the bar rather than dinner menu. Sitting at our table for two did not impede our view of the inlet or the amazing sky. Our server Josh was welcoming, conversational, and attentive without being intrusive. Our order included the Hawaiian nachos (you really need to try these); the calamari (amazingly tender and tasty); and the salmon sliders (a symphony of subtle flavors). Our light meal at Anthony's set the tone as we went on to a fun evening filled with music and camaraderie. Excellent service. The special is top notch and a great value. Wonderful Sunset Menu value. Great for meeting with friends. Parking can be a challenge, depending on the size of your vehicle. Great food and great view. Noise levels are very high when the restaurant gets full. Once we were seated, it took an unusually long time to be greeted by a waiter; it seemed as if there was confusion among the staff. One of our favorites places to dine. Our relatives wanted good seafood. This is where to go for great food. Always the best! Celebrated husband's 82 birthday. The family expects us to meet at Anthony's Sinclair as it is a family tradition and never disappointed. Thanks and keep up the good work! Good experience, table could have been cleaned but food, service and atmosphere were on point. The server made us feel very welcomed and comfortable. The food was as expected, delicious as always. A lovely view of the Puget Sound. The complimentary parking near the elevator is nice. We enjoyed the meal and atmosphere during our visit Saturday. We especially enjoyed the service provided by Yelena. She made us feel welcome and was attentive while giving us enough time to relay and enjoy the evening. Kudos to Yelena!! Food is consistently good. Service was a little slow...took the waitress four reminders to refill my tea. Noise levels when the restaurant is full are always too loud. Makes it hard to hold a decent conversation. Made last minute reservations, got seated promptly. The place was busy as there was a performance at the Admiral Theatre that evening. The waitress was great. The wife ordered the blackened rock fish, she thought it was very good. I had the lingcod fish and chips. Both the fish and fries were soggy and not crisp but oily and limp. The ginger slaw was the best part of my meal. Meal was overpriced for what we received. Have been to other Anthony’s and had great meals. Not so much at the Bremerton location! I took my Mother there for her 80th Birthday. The staff couldn’t have treated us.. her any better. The food was wonderful and so were the views. I understand that Valentine’s Day is always busy here. However, it was disappointing. I made a reservation a month in advance and specifically requested a table by the window. When I verbally confirmed the day before, the person did say that they try their best to accomodate seating requests but sometimes its not always possible. I understood that. After waiting 30-40 minutes, we were seated but it was not at a window table. I saw that there were a couple window tables setup and empty. I asked the hostess why we were not seated at one of the empty window tables and she replied that those are reserved for people who specifically asked for window seating. After telling her that I too specifically reserved and requested a window seat a month ago, they sat us at a window seat after double checking my reservation. However, it was extremely rude for the hostess to feel the need to mention that those tables were suppose to be for the owner’s friends or “Bill’s friends” as she put it. Her tone insinuated that she was only placing us there just cus I voiced their error on my reservation I initially requested. Well whats the point of a reservation then, sweetie?!? On to the food.....I only ordered the seafood dip as an appetizer along with a caesar salad/clam chowder combo for dinner. I specifically asked for shrimp on my salad and the waitress verbally confirmed it. Never got my shrimp and the caesar dressing tasted like a creamy dijon concoction. Yuck! We never saw our waitress besides getting our drinks and getting the check. Yes, the place is pretty with a nice view but there should be more to dining out, dont you think? Overall disappointing! Walking in and seeing the marina and the ferry is always nice. We feel right at home getting our usual table and being greeted by servers who know our names and whom we know. We brought two guests who thoroughly enjoyed the food and ambiance. Going back for my husband's birthday. QUITE HELPFUL IN CHOOSING OUR MEAL AND WINE. Great food. Nice view. A little to much noise though. Hard to have a conversation at times. A good time and good food. The salmon was very good and my family enjoyed their meals as well. Parking was full and had to pay for lower garage. Service was good and attentive. If in the area, would go back again. We come to Anthony"s often. We always have a great experience in al areas. We went for my son's 12th birthday on a Saturday night and it was great. We spent about $150 for 2 adults, three kids, and one cocktail. It's important to note that they have a kids' menu but my kids didn't order off of the kids' menu because it's the typical mac-n-cheese, cheeseburger, fish-n-chips type stuff. My kids who are 5, 10, and 12 had Island Delight (mahi-mahi with macadamia nut basmati rice, coconut shrimp, and veggies), Seafood Fettucini (with prawns, shrimp, Penn Cove mussels, and scallops), and Ahi nachos respectively. We were unable to order Lobster at the time unless we wanted to wait for our tails to thaw out first. This was disappointing to hear; not only that we couldn't have lobster but that if we'd been able to order lobster it would have been frozen. Everything we did get was really good and the Ahi Nachos were a highlight for sure. I highly recommend those. I also had an amaretto sour which was well made and reasonably priced for a cocktail. We took my in-laws out to dinner at Anthony's before a show at the Admiral Theater. On this visit, it was truly a few steps above previous visits. The service was prompt, courteous, knowledgeable and super friendly. They went out of their way to make sure we had a special meal and that everything was to our liking. We all ordered the alder-planked salmon and it was delicious! We also had Caesar salads and calamari. Everything was really tasty- we were so happy we went there.